Well, it almost goes without saying that Quentin Tarantino has one of the most distinctive voices in Hollywood. He's an acquired, quirky taste, to be sure, but when he strikes gold—and he does every now and again—it's pure gold. He's maniacal; a true cinephile and auteur (in the purest sense of the word), and one who knows every nook and cranny that's preceded him, along with how his latest machinations will intentionally violate each and every one of them, breaking new ground in doing so. Inglourious Basterds and Django Unchained, for all their violence, were amazing additions to his canon. Yes, there's some wincing, but I absolutely loved them. Was blown away; pun intended. They are so rewarding...good guys winning—bad guys losing—and big time. 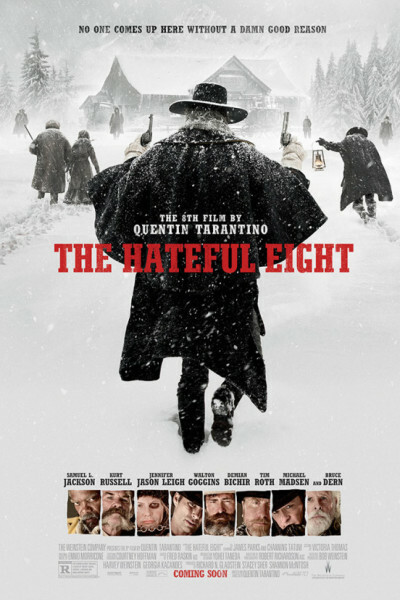 The trailer for his latest, The Hateful Eight, promised what almost appeared to be the third in a visual trilogy; homages to Leone's and Eastwood's spaghetti westerns. I was not disappointed, and the same can be said for the entire theater in which I sat, as evidenced by its exuberant, rafter-raising whoops, hollers, cheers, and laughter. The film's got some <ahem> killer one-liners. At three hours, The Hateful Eight takes its own sweet time, and nearly every moment is purposeful and delectable. It is so infrequent these days to observe a ponderous, wandering film that focuses on a still image for minutes on end yet leaves you wanting more. The opening shot alone, which includes a two to three-minute pan across a wooden, snow-covered roadside crucifix is at once sobering and momentous. Throughout it, we acclimate to the credit's font type, score, cinematography, mood, and overall tone, each of which—in its own utilitarian way—serves to foreshadow and prepare our constitution for a tale of judgment, woe, and possible jubilation. The first third of the film occurs in a blizzardy stagecoach ride en route to Minnie's Haberdashery, and Acts II and III amount to Ten Little Indians in a pistoled saloon. Jackson, Russell, and Roth are great, but this is as much Walton Goggins' movie as anyone else's (! ), which was both a massive surprise and absolute delight. He has so many winking, delicious lines that you'll wanna sop 'em all up with a biscuit. I suspect some will say the film is too long, too tedious, too violent. I see their point and cannot disagree with them in any mathematical way. It is indeed gratuitous in these regards, and also indulges in unnecessary and distracting voiceovers by Tarantino himself, but the film is so thoroughly unique that it really warrants a scorecard of another kind. Rather than thinking to oneself, "I should have ordered a salad," just admit that you've come to the candy store to die, and die you shall. To that end, you'll engorge on ham-handed lines, costumes as subtle as a peacock party, Union and Confederate stereotypes, predictable plot twists, more beatings/dismemberments/exploding heads than any one film requires, and blood-spattered floors and walls and furniture that only Hansel and Gretel could fully appreciate. But you'll also bust your own gut laughing and reveling in hearing characters say and do precisely what you wish they would. When all is said and done, sure, you might feel a tad sick at your tummy, but you'll mostly feel gleeful for having finished an entire platter of cupcakes all by yourself. The strangers to your right and left will high-five you now and shout (in that after-film glow we all know and love), "Holy Spicoli, that was some crazy spaghetti!" Your seatmates, in all their excitement, will have been 100% right: "the 8th film by Quentin Tarantino" is a wild and wacky ride, but one achieved preponderantly through the spoken word and stillness (juxtaposed against violence), which is a stirring and rare feat these days, more reminiscent of Stratford-upon-Avon than Hollywood. "Ooh, that's a bingo," he said, and I'm confident you'd have it no other way.